Our guests can have three for free at the non-smoking La Quinta Inn & Suites Bismarck with complimentary Wi-Fi parking and continental breakfast. Animal lovers can pack up the pooch for a visit to this pet-friendly hotel with four floors and 90 rooms. All accommodations include pillowtop mattresses free Wi-Fi flat-panel TVs microwaves refrigerators and coffeemakers. Suites with jetted tubs and sofa beds are also available. In the morning fuel up at the free continental breakfast. Exercise enthusiasts can work hard in the fitness center while office devotees can head to the executive meeting rooms. Afterwards everyone can unwind in the indoor pool or catch up on the day's events with a free newspaper. There is also a guest laundry. Parking is complimentary. 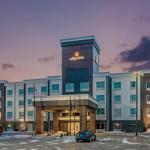 La Quinta Inn & Suites is conveniently located off Interstate 94 on State Street/Route 83. The hotel is less than one mile from Bismarck State Capital and North Dakota Heritage Center. Golfers can swing like the pros at Hawktree Golf Course a 20-minute drive while sports fans catch some courtside action at Bismarck Civic Center home of the Dakota Wizards minor-league basketball team less than two miles away. The hotel is four-and-a-half miles from Bismarck Municipal Airport.